Bring your Oboes, Bassoons, English Horns and Contrabassoons for a Full Day of Music Making! 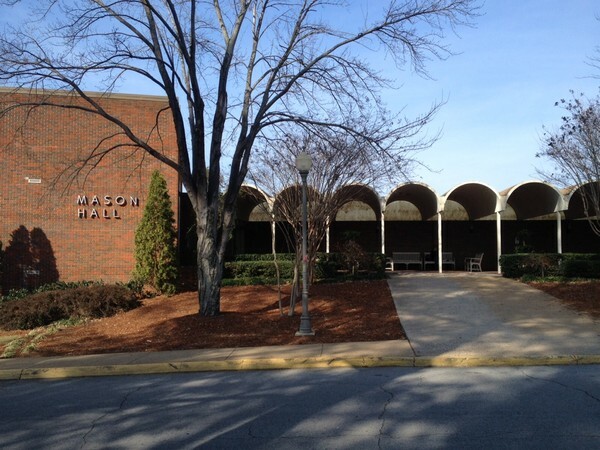 HOW TO FIND MASON HALL on the JSU Campus AND PARKING for our upcoming JSU Double Reed Day. This is the Outside of Mason Hall- when you see this, YOU’RE HERE! MASON HALL: Turn onto UNIVERSITY Circle from 21 (This is across from the library- the tallest building in Jacksonville). When the Circle Splits (you can go left or right) GO RIGHT to TRUSTEES CIRCLE! It will take you down the hill. Continue until you see the building pictured. Parking: JSU relaxes parking restrictions on the weekend. Parking along Coffee Circle, (outside of Mason Hall), near the dorms is all open and available without a JSU Parking Decal. If by chance, UPD makes a mistake and issues you a ticket, please bring it to me, Eryn Oft and I will take care of it with the University authorities. Take I-20 East to Exit 185 (Anniston/Oxford – Alabama Highway 21). Turn left onto Alabama Highway 21 North. Go through Oxford, Anniston/McClellan, and the Jacksonville square (about 20 miles). You will see twelve story Houston Cole Library on the right and the marble University sign on the left. The entrance to the university is on your left. Please consult the Campus Map for your desired location. Take I-20 West to Exit 185 (Anniston/Oxford – Alabama Highway 21). Merge right onto Alabama Highway 21 North. Go through Oxford, Anniston/McClellan, and the Jacksonville square (about 20 miles). You will see twelve story Houston Cole Library on the right and the marble University sign on the left. The entrance to the university is on your left. Please consult the Campus Map for your desired location. Take US-HWY 431 (Governor’s Drive) South through Gadsden. Once south of Gadsden, turn left onto AL-HWY 204. Highway 204 leads directly to campus. Please consult the Campus Map for your desired location. Take US-HWY 231 North. In Sylacauga, take AL-HWY 21 North off of US-HWY 231. Go through Talledega, Oxford, Anniston/McClellan, and the Jacksonville square (about 20 miles). You will see twelve story Houston Cole Library on the right and the marble University sign on the left. The entrance to the university is on your left. Please consult the Campus Map for your desired location. Travel on Highway 27 South to Cedartown and take US-HWY 278 West to Piedmont, Alabama. In Piedmont, turn left on HWY 200. Highway 200 merges onto AL HWY 21 South. Follow HWY 21 South to Jacksonville. You will see twelve story Houston Cole Library on the left and the marble University sign on the right. The entrance to the university is on your right. Please consult the Campus Map for your desired location.